The taste of the gingerbread cupcakes is still lingering, both in my head and on my tongue. 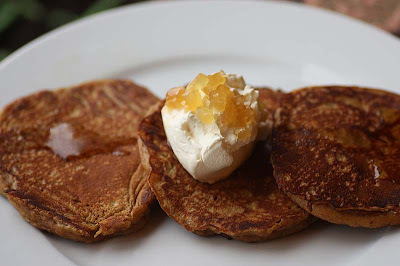 So you can imagine my excitement when I came across a gingerbread pancake recipe in one of my cookbooks. So to pick up on this gingery journey, I made some Gingerbread pancakes for breakfast. It takes a bit of practice to make these. I had trouble flipping them over in the frying pan. Then I realised I wasn't cooking the one side enough. It needed to bubble and firm up a little before flipping over. Also I had to ensure the heat was right, too hot and the pancakes would char, too low and they looked undercooked. But after making the first few, I finally got a hang of this skill. These pancakes are more molten brown from the molasses and the dark spices. I especially liked the surprise hit of the freshly ground cloves. These pancakes were served with whipped cream, maple syrup and glace preserved ginger pieces for extra bite. If you have any pancakes left over, just warm them in the oven and serve with vanilla ice-cream which is exactly what I'll be doing in a little while. As this is an American recipe, the measurements come in cups rather than grams. If you think the quantity below is too much, you can always divide the quantity of the ingredients. My next ginger flavoured recipe is waffles! Combine flour, baking powder, spices and salt. In a separate bowl, beat eggs and whisk in the remaining ingredients. Combine the wet and dry mixing well. Oil a medium frying pan and ladle about ¼ cup of batter onto the hot surface for each pancake. Let the first side cook for 3 – 4 minutes. Turn once and cook on the second side briefly to finish. From The Tassajara Recipe book. These sound wonderful, love all those spices and we have ice-cream that needs using up. I used to have a copy of Tassajara, but don't remember this recipe. I got rid of it on one of my periodic cookery book clear outs - now regretting it! 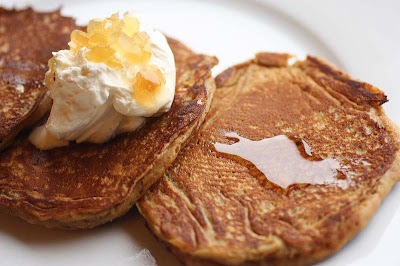 Georgous & awesome gingerbread pancakes: thick & fluffy, just the way I like them!! Mmmmm. I'm the most crazy person I know for pancakes, so I'm really digging this post. They look wonderful. I find it usually takes the first batch, getting the heat just right, etc., before making them perfectly. Yummy! sounds delicious. I love anything ginger and anything gingerbread. Love how you've dressed it up! you're maing me hungry. I can't remember last time I had pancakes. I may need to make some for lunch ! They really were and they were not to bd reheated either. I'm sorry to read that you no longer have your copy of Tassajara. I only picked up this reprinted version recently, so it may be a new up-dated version from the original, hence you not remembering the ginger pancake recipe. I find it really hard to get rid of my cookbooks, I have done so, but its mainly been non-vegetarian one. These pancakes were certainly fluffy. I'm so glad your digging this recipe Eve. And you've made me feel much better by stating that 'it usually takes the first batch, getting the heat just right, etc., before making them perfectly'. Thanks! Thank you Wendy. The added ginger pieces were really welcome. I do with all my heart hope your getting better now x I am pleased to read that you 'love' the look of this recipe. Even better that you have all the ingredients for in the cupboard for this, as I am going to say to you - MAKE IT - its adds that flavour in your mouth that is really appreciated when you've been poorly. They are just about okay cold for work, but my recommendations are heat them up in the oven a little if you can, much nicer. Take care Missy. Indulgent holiday in West Wales, I am envious, I have them when I see my mum there. All my family live in Wales and I haven't been back since I got married (over a year ago), I must make an effort this year. You must be really excited about viewing this cottage. I do hope it ticks all the right boxes for you and your family. Having a good sized garden would be wonderful too. It'll be a great way to get the kids involved in growing and eating some of their own too, and maybe you can expand from toms, strawberries and lettuces! I live in a upper flat and have only a small tiny garden plot. Some food can be grown at home, though a bigger garden would be appreciated. Fingers crossed re the cottage and possibly your new home! Thank you Stephanie. I really did enjoy these. The flavour may be a bit too strong for little one, but I strongly recommend them to adults. so if you get the chance, please do have a go at making some of these for yourself. I think these pancakes benefited with the drizzle of maple syrup (even agave syrup would work) as these pancakes were not overly sweet. Plus they gave it a little moisture too. I will def. come by your blog again. It is a wonderful place. Gingerbread is one of my absolute favorites. These look heavenly! 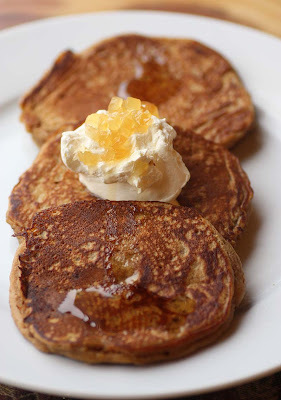 I've never had buckwheat pancakes ever, must give them a go some day. I've been eating too much dairy of late, so need to cut down. 'Icing on the pancake!' I like it. I have that cookbook, why haven't I ever made these? They look extra tasty with the whipped cream and ginger pieces. The only reason I can think of it, the book doesn't have photos of the recipes...What do you think?! I have often passed by a recipe, then a year or two later, wonder - how did i miss that? !